My sister-in-law is shopping for a new laptop and has been customizing a nice little unit on Dell.com. Only problem she’s had is trying to get a system without Windows Vista. Like many people she’s been happy with XP and isn’t ready to switch. 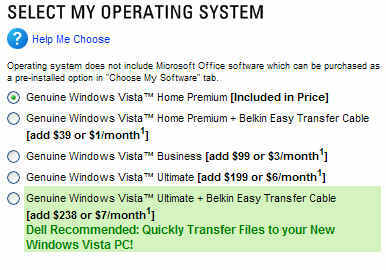 Unfortunately, Dell only offers Vista on new machines! So, I braved the online chat with a Dell representative and asked she could order her system with Windows XP. The answer was No! She can’t have XP installed on her new Dell but he recommended downloading Microsoft Virtual PC. That way she could still create a partition and install Windows XP on it. I went to Gateway.com and asked somone named Shayla the same question. I was much happier with their response. BillP says: Hi Shayla, quick question. My sister is looking for a new laptop. Can she still order one with Windows XP installed? Shayla says: Would you like me to help you customize a system? BillP says: So Microsoft isn't forcing companies like Gateway to push Vista? I’ve been seeing BCC or Blind Carbon Copy mentioned a lot lately including a mention in a newsletter from the folks at Cloudeight Information Avenue who included instructions on adding BCC to Outlook Express. Open Outlook Express (or Windows Mail if you're using Windows Vista) and start a new message. When you're in the message compose window, click "View" and check "All Headers". The BCC line will appear in the message you're now composing and in all future messages unless you go back in to "View" and uncheck "All headers". Blind Carbon Copy allows you to send the same Email to multiple people, but hides the names and addresses from others receiving your Email. In most cases, I prefer to use BCC when sending Email to multiple recipients. It’s a benefit to the sender. You may not want everyone on the list to know who else you think is important. Perhaps you don’t want your husband to know you still include an old boyfriend’s Email when sending out a dirty joke. It’s a benefit to your recipients. You may have given me your personal Email addresses. If I just CC or Carbon copy the Email, everyone else on the list will now know your Email address. The less people who have your Email address on their computer the better. If anyone on the list gets infected by some kind of worm, your Email address may be sucked up off their machine into a malware database. It’s a benefit to the world. Using BCC saves less informed people from making the mistake of clicking on “Reply All” and sending their response to everyone on the list. This has been known to cause an avalanche of Reply-All’s that result in angry “Take me off your $#%& list” responses. When the basic AOL Email form was first created some 20 years ago there wasn’t room on the form to include a BCC input box. There’s only Send To and Copy To. The secret? Surround the names in your Email list with double parentheses. On the AOL Email system this is still interpreted as a Blind Copy. While I’m on the topic of AOL secrets, I’m reminded of another undocumented feature we created over 20 years ago and still remains. Want to temporarily block everyone from sending you an Instant Message? Send a message, any message to the user name “$IM_off”. This will put you into a private mode where no one can reach you. Want to turn it back on? You can just sign off or send another message to “$im_on”. You can even include someones screen name so they’ll still see you on their buddy list, but they can’t IM you. Just use $im_off screen_name. It seems like it happens overnight doesn’t it? Google was suddenly the principal search engine. ZIP became the chief compression tool for downloads. JPG turned into the standard format for cameras and photo files. MP3 developed into the most popular format for storing and listening to music files. So who owns the rights to the MP3 format? According to a jury in San Diego, Alcatel-Lucent(Bell Labs) holds the patent to MP3. They are so convinced they ordered Microsoft to pay $1.52 Billion in damages for including MP3 in Windows without paying royalties. Yes, “Billion” isn’t a typo. As you might guess, Microsoft disagrees with the jury and will seek relief and appeal if necessary. My guess is they can hold this up in the courts until the patents expire. Microsoft thought they had full rights after paying the German based, Fraunhofer Institute $16 million to license MP3 technology. Apparently, the Fraunhofer Institute helped develop MP3 with Bell Labs but key patents were filed by Lucent. According to MP3Licensing.com the format is owned by Fraunhofer Institute along with Coding Technologies, Agere and Thomson(RCA). They have a list 453 other licensees who may be the next target of Alcatel-Lucent. You know you must be doing something right when the bad guys gang up on you and try to shut you down. This happen recently to our friends at CastleCops.com. On February 13th, the attack on their servers began and was able to disrupt service for almost a week. A DDoS or Distributed Denial of Service attack is orchestrated by bad guys who have infiltrated a large number of computers around the world. Software hidden on machines is used to send millions of requests to a single site in hopes of overwhelming it and preventing normal users getting help. Most folks have no clue that their computers are being used in such attacks. Forums like Castlecops help normal users identify and get rid of these infiltrations. Unfortunately, the only solution for folks like Paul and Robin at CastleCops is to pay more to their server provider. This can become a big expense for forums who provide services thanks to volunteers and donations from users. I frequently donate to forums like CastleCops.com and I recommend all my friends do the same. A small donation of $25–$50 can pave the way for hundreds of users to receive help for catastrophic computer problems. So, if you’re a regular at one of the helpful online forums, show your support today and click on that donate button. I’ve written about Direct Revenue before including their troubles with New York State’s Attorney General’s office. No matter what they’re accused of they wiggled their way around it and accept a little slap on the hand now and then. Last week Direct Revenue settled with the Federal Trade Commission to the tune of 1.5 million in “ill-gotten gains”. “Federal Trade Commission charges that they used unfair and deceptive methods to download adware onto consumers’ computers and then obstruct them from removing it, in violation of federal law. In my business about 5% of any sale goes to PayPal or other credit processing companies. It’s one of the costs of doing business. For Direct Revenue, there’s the similar cost of doing business but in their case, it’s something that is unethical and illegal. Until the FTC steps forward and padlocks the doors of these companies, more business’s will be created with model’s based on deceit. PC World’s Steve Bass always seems to find the best of the best. Yesterday, he clued readers in on a new video on YouTube which puts computer support in true perspective. It’s from a Norwegian show called Øystein & Meg and while you have to read the English subtitles, you’ll easily get the message. Anyone who has ever done computer support (or needed support) will relate and laugh their butts off. Yesterday was another “Patch Tuesday” and millions of computers were automatically updated with fixes to critical vulnerabilities found in various Microsoft Windows components. To many it was just another security update but it was one of the most important updates I’ve seen and one of the most embarrassing for Microsoft. Click here for more details. I’m surprised Microsoft didn’t announce a ZunePhone or MicrosoftTV this week to distract the press. A number of updates were for components used by thousands of non-Microsoft applications. The ActiveX HTML Help component, the RichEdit Text Control component and even the underlying code for many applications, Microsoft’s Foundation Classes were found to include vulnerabilities. The most embarrassing has to be a critical vulnerability in the Microsoft’s own Malware Protection Engine. This reminds me of the company who made bike locks only to discover they could be unlocked by using a ball point pen. If a scan runs into a specially crafted PDF file, the target computer could allow remote execution of malware. At this time we haven’t seen any threats using this vulnerability but it’s only a matter of time. I commend Microsoft for their honestly, but computers which have not been updated are at immediate risk. This basically tells the bad guys which mat to look under for the keys. If users don’t change the locks by downloading this weeks updates their doors will be wide open. I’m pleased to announce the release of another new and improved WinPatrol. This year WinPatrol will celebrate its 10th anniversary of helping users understand what is happening inside their computer. WinPatrol 2007 has been improved in many ways but the most popular new feature is called "Delayed Start". This will help make your computer startup faster then ever! The newest WinPatrol remains compatible with Windows 95 thru the new Windows Vista operating system. WinPatrol runs great with Windows Vista and takes advantage of its new enhanced security features. If you use Vista’s UAC(User Access Control), you may find some startup programs require your permission before they can begin. Moving these programs to our Delayed Start list will prevent simultaneous annoying systems pop ups every time you restart your computer. All new features are available on the free version of WinPatrol. This is possible thanks to the support of those users who do upgrade to WinPatrol PLUS. Over the years WinPatrol has created an almost cult following and since we don’t have an advertising budget we owe our success to word of mouth of Scotty’s friends. Download the newest WinPatrol at http://www.winpatrol.com/download.html. Ten months ago I wrote about what we could expect once Microsoft ramped up its marketing of Windows Vista. (Windows Vista, As Seen on Oprah). In closing, I made the following comment. Who knows, we could even see ads for Microsoft Vista in free products from Claria or spam with the subject line, “Windows Vista, As Seen on Oprah”. It turns out Microsoft thought it was a good idea. I’m now reading reports that Microsoft is actively looking at how to get Oprah to consider Vista for her yearly “Oprah’s Favorite Things”. Among Oprah’s Favorites for the Holiday 2006 was the Apple iPOD. According to my Blog stats, 3.73% of Bits from Bill readers have made the jump to Vista. I have heard from a few new Vista users and only one complained about UAC. The biggest problems reported so far have been both software and hardware compatibility issues. I had hoped to write more while I was away on a geek cruise but our boat has some technical limitations. They say normally they don't have problems but this week it's been tough to stay online. When I have gotten online it's been pretty slow. The price varies but if you purchase 1000 minutes it comes down to 29 per minute. One of our speakers, Harry McCracken has also blogged about our trip and noticed that the internet provider on the seas has some limitations. When Harry tried to use Skype a dialog appeared letting him know access was restricted. Click below to read more from Harry. Otherwise I'm pretty happy to be away recharging my batteries and I'm not missing the sub-zero temperatures back home. I'm currently on a ship in the Caribbean with a number of other geeks enjoying warm weather and discussing Windows Vista, Photoshop and other tech topics. 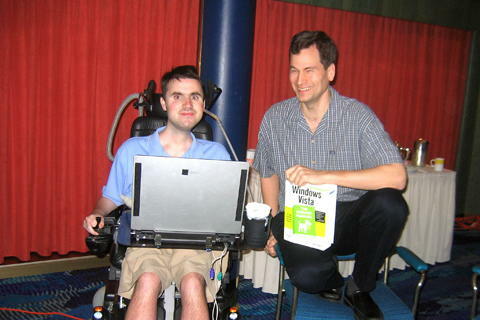 Most of Sunday I spent with author and columnist David Pogue who has a new book on sale called "Windows Vista, The Missing Manual ". I have learned a number of great tricks and my opinion of Vista has become more positive. What was really fun is that David did his entire presentation of Vista by running it on his MacBook. Later this week David will be discussing Vista Security. I doubt he'll know about our new WinPatrol 2007 but I'm eager to hear more about what he thinks of Vista's User Access Control.